Hindley is also intent on splitting up Catherine and Henry, siblings on the cusp of admitting that their feelings for each other might be just a teensy bit more complicated than they should be. Of course, they never get around to admitting their feelings to each other before Hindley throws his oar in and muddies the waters. Told in alternating view points, we see Catherine mooning over Henry and Henry mooning over Catherine – but nothing much comes of it, especially once Hindley banishes Henry to the basement of their huge house in The Heights (a tony neighbourhood in San Francisco) and sends him to a rough school way across town where Henry is constantly in danger of being beat up. Make no mistake, he’s tough and can handle himself – and without Catherine’s calming influence, he’s more likely to swing than swoon. James tries at Bronte’s themes: obsession, class, revenge – but the problem with The Heights, for me at least, is that the novel’s contemporary setting makes the characters seem sort of inert. I never wanted them to be together because neither of them seemed all that sympathetic. And yes, you could make the same case for Catherine and Heathcliff – but Bronte’s sweeping tale somehow elevates those characters to mythic, romantic heights in a way James never quite manages. 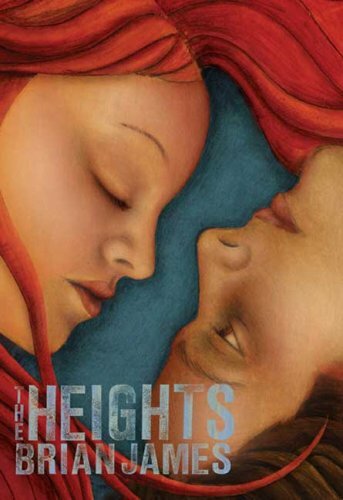 I will be happy to encourage my students to read The Heights, but even happier if they go on to read Wuthering Heights. This entry was posted in 365 Days 2012, Book Chat and tagged 2012, Book Review, teen by Christie. Bookmark the permalink.